Left to right: Kieran Oleary (PhD researcher, MaREI Centre, UCC), Dr Andrew Cashman (Lecturer, CIT), ChristiaanHomann (Senior Energy Analyst, Mainstream Renewable Power), Her Excellency Ambassador Cáit Moran, Dr V Nguyen Dinh (Offshore Wind Manager, MaREI Centre, UCC), Hoa X Nguyen (PhD Researcher, Trinity College Dublin), Dr Michael Harte (Senior Engineer, Ørsted, Former PhD researcher, Trinity Collge Dublin). Ambassador Cáit Moran and Mr Trần Hồng Hà, Minister for Environment and Natural Resources addressed the opening of the First Vietnam Symposium on Advances in Offshore Engineering (VSOE 2018). 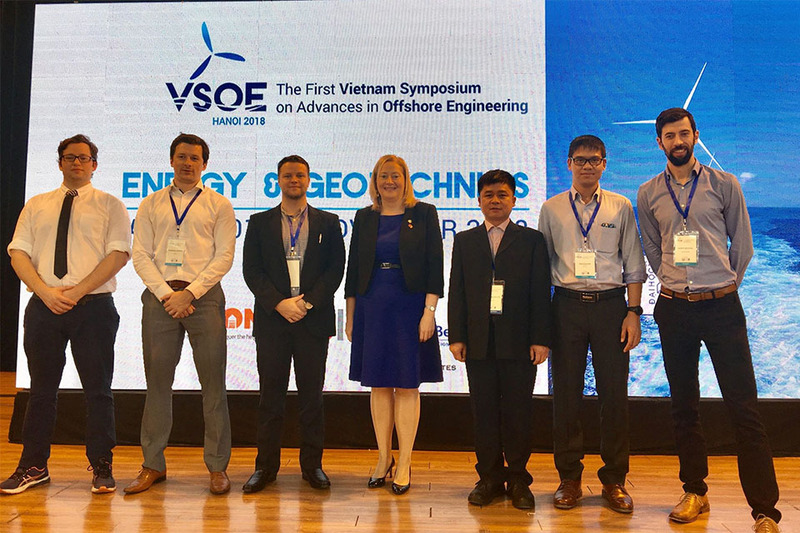 The two-day symposium VSOE 2018 was organised on 1st and 2nd November by the Association of Vietnamese Scientists and Experts (AVSE Global) in collaboration with the National University of Civil Engineering (NUCE). VSOE aims to create a platform for researchers, practitioners, policymakers, and entrepreneurs to discuss and promote technology and policy changes toward renewable energy, generate both local and international business opportunities in oil and gas and offshore renewable energy, and to address climate change and energy security. The Symposium attracted over 150 participants. The first symposium VSOE2018 seeks to bring together knowledge and experience gained recently in offshore engineering and technology innovations, cost-effective solutions for safer structures, environmental protection, hazards, vulnerability and risk management. The symposium programme included paper presentations, poster sessions and project demonstrations, along with keynote presentations from researchers, academics and technologists from leading universities, research firms, policymakers, entrepreneurs and practitioners. There was active participation of Irish and Vietnamese experts in this forum from Nguyen Dinh of University College Cork (UCC), Cork Institute of Technology (CIT), Trinity College Dublin (TCD) and from the private sector, where leading Irish renewables company, Mainstream Renewable Power, which is investing in Vietnam, shared its expertise.